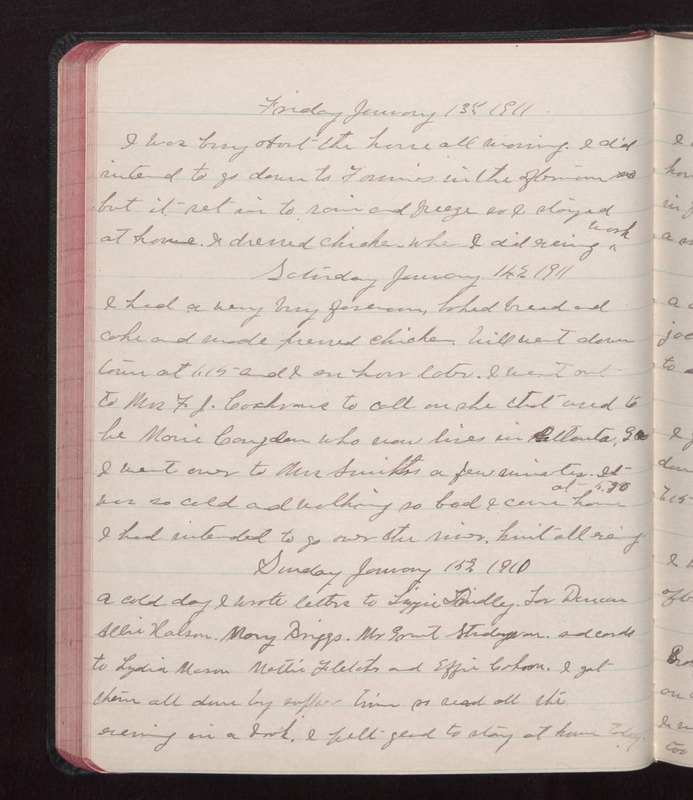 Friday January 13 1911 I was busy about the house all morning. I did intend to go down to Fannies in the afternoon but it set in to rain and freeze so I stayed at home. I dressed chicken when I did evening work. Saturday January 14 1911 I had a very busy forenoon, baked bread and cake and made pressed chicken. Will went down town at 1.15 and I an hour later. I went out to Mrs F J [Coachvane?] to call on she that used to be Marie Congdon who now lives in Atlanta, Ga I went over to Mrs Smiths a few minutes. It was so cold and walking so bad I came home at 5.30 I had intended to go over the river. Knit all evening. Sunday January 15 1911 A cold day I wrote letters to Lizzie Lindley. [illegible] Duncan Allie Halsom. Mary Brigs. Mr. Grant [Stidegon?]. and cards to Lydia Mason Mollie Fletcher and Effie Cahoon. I got them all done by supper time so read all the evening in a book. I felt glad to stay at home today.